Bodo Diemer was a Luftwaffe torpedo bomber pilot and flew combat sorties against Allied convoys in the Med, against the D-Day invasion fleet in the Channel and against the Murmansk convoys in the Artic Sea. The torpedo bomber Gruppen of the Luftwaffe sustained some of the heaviest losses of any Luftwaffe units – out of 40 crews he knew personally, only 3, including his own, survived, hence the title of the book which roughly translates to ".. Survival chances - nil..."
Since writing down his wartime experiences at the end of the war while a POW, Bodo Diemer has wrestled with the dilemma of whether or not to put them before a wider audience. Finding a publisher was half the battle. Helios Verlag have a track record of publishing interesting Luftwaffe books and a while ago asked Diemer to prepare his account of his experiences for publication and this nice 322-page volume is now available from their site or your favourite online bookseller. What follows here are my impressions of this worthwhile title and a couple of extracts that I have translated from the German-language text. Diemer arrived at IV./KG 77 then based in the south of France fresh from training school in early 1944 having enlisted in 1940 and participated in the Norwegian campaign as a driver in an engineering unit. IV./KG77 were flying the Ju 88 A-14 and A-17 torpedo bomber variants and his first Staffelkapitän was Knights's Cross holder Oblt. 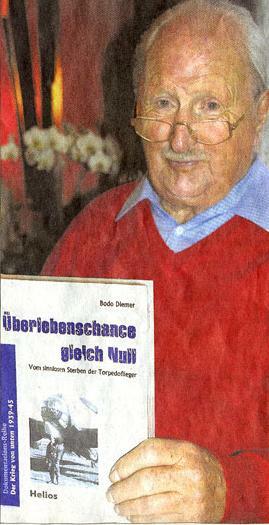 Johannes Geismann (10./KG77). By that stage of the war his elder brother Arno had already been shot down and killed in a 2./KG 6 Ju 88, falling to an RAF nightfighter over the UK. Elsewhere the family business had been taken over by a 'Nazi' armaments concern. Based as he was in France, Diemer was in regular telephone contact with his family in Germany - both Diemers' parents had voted for Hitler’s NSDAP but did not regard themselves as Nazis and as the intensity of the bombing war builds over the homeland disillusionment and despair increasingly sets in. Diemer’s accounts of flying the Ju 88 are written in a very straight forward 'Fliegersprache' – aviators language. 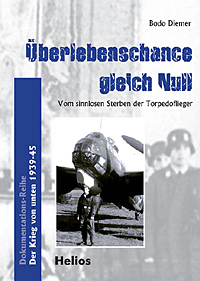 He describes sorties flown against shipping convoys out over the Atlantic and the Med from the point of view of his crew with plenty of interesting details and insights into the daily life of Luftwaffe bomber crews operating in the late–war period – unreliable, malfunctioning torpedos and equipment, poorly trained crews and out-moded aircraft.
" ..Flying at wave-top height in darkness was the bread-and-butter of the torpedo flyer. Too low and you risked a watery grave, too high and you would be easy prey for the nightfighters...those of our comrades who came to us having passed out from the abbreviated C-Schule programme then in place and who had not been trained for this type of flying were as good as dead already.."
The strain of having to fly the brunt of some hair-raising sorties in the teeth of overwhelming defensive firepower from Allied air and sea power is unremitting.